Mobile devices create new managesensitive data outside the organization via ment challenges, too. But Steve Brasen, emails, social media posts, mobile devices or a Research Director at market watchers public ﬁle-sharing services such as Dropbox. Enterprise Management Associates, warns If employees must use ﬁle-sharing services, that mobile management isn't just about DLP solutions can prevent information theft devices anymore. "Users want to access their by requiring that their ﬁles be encrypted. data from any device at any location," he And since mobile devices also get lost and explains. "So what we previously referred to stolen, mobile device management (MDM) as mobile device management has become tools provide another essential capability: enterprise mobile management." remote and selective data wiping. That's because many organizations Increasingly, experts predict, MDM will now expose their application functions need to merge with desktop management and information to third-party mobile to empower IT to discover, provision and applications via application programming — Karen Sage, VP of Product manage the lifecycles of all enterprise endinterfaces (APIs). Airline ﬂight informauser devices, both desktop and mobile. Marketing, New Business Initiatives tion is a perfect example: The information This merged combination will also autoCA Technologies is provided through APIs, then used in mate device provisioning, application and many mobile applications. Tools from security-patch distribution, and provide suppliers such as API security and management vendor Layer 7 management and reporting of software licenses. Technologies (recently acquired by CA Technologies) apply security Self-service is emerging as another requirement. Some MDM policies that control APIs and data access and deﬂect application tools now offer enterprise app stores, similar to Apple's, where layer attacks so that critical, sensitive applications and data can- users can download applications that have been prescreened and not be compromised. approved by IT. Many MDM solutions also let users self-provision new devices so they can be up and running in minutes. Wrapping Apps Mobile technology also places new demands on application Because so many enterprise employees and customers use enter- development and performance. 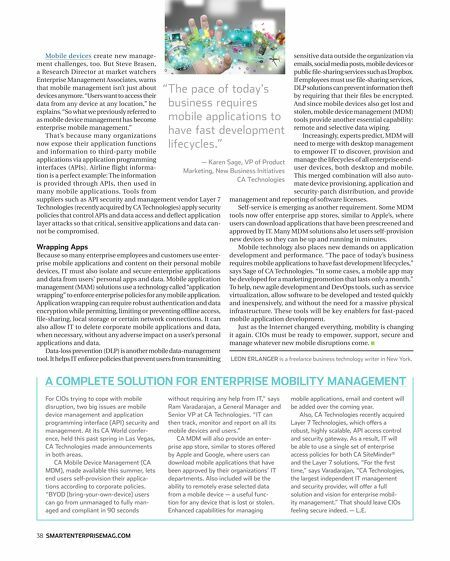 "The pace of today's business prise mobile applications and content on their personal mobile requires mobile applications to have fast development lifecycles," devices, IT must also isolate and secure enterprise applications says Sage of CA Technologies. "In some cases, a mobile app may and data from users' personal apps and data. Mobile application be developed for a marketing promotion that lasts only a month." management (MAM) solutions use a technology called "application To help, new agile development and DevOps tools, such as service wrapping" to enforce enterprise policies for any mobile application. virtualization, allow software to be developed and tested quickly Application wrapping can require robust authentication and data and inexpensively, and without the need for a massive physical encryption while permitting, limiting or preventing ofﬂine access, infrastructure. These tools will be key enablers for fast-paced ﬁle-sharing, local storage or certain network connections. It can mobile application development. also allow IT to delete corporate mobile applications and data, Just as the Internet changed everything, mobility is changing when necessary, without any adverse impact on a user's personal it again. CIOs must be ready to empower, support, secure and applications and data. manage whatever new mobile disruptions come. I Data-loss prevention (DLP) is another mobile data-management tool. It helps IT enforce policies that prevent users from transmitting LEON ERLANGER is a freelance business technology writer in New York. " The pace of today's business requires mobile applications to have fast development lifecycles." 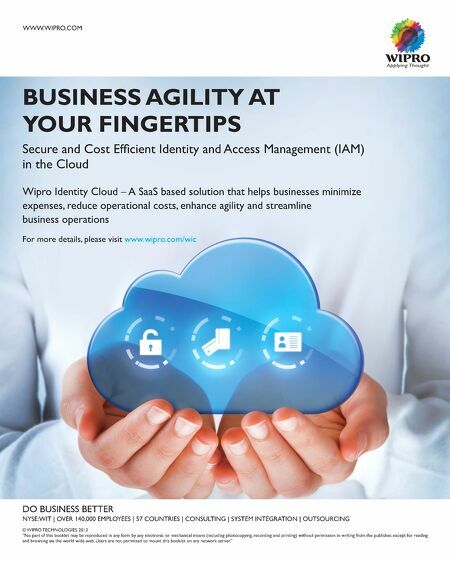 A COMPLETE SOLUTION FOR ENTERPRISE MOBILITY MANAGEMENT For CIOs trying to cope with mobile disruption, two big issues are mobile device management and application programming interface (API) security and management. At its CA World conference, held this past spring in Las Vegas, CA Technologies made announcements in both areas. CA Mobile Device Management (CA MDM), made available this summer, lets end users self-provision their applications according to corporate policies. "BYOD [bring-your-own-device] users can go from unmanaged to fully managed and compliant in 90 seconds 38 SMARTENTERPRISEMAG.COM without requiring any help from IT," says Ram Varadarajan, a General Manager and Senior VP at CA Technologies. "IT can then track, monitor and report on all its mobile devices and users." CA MDM will also provide an enterprise app store, similar to stores offered by Apple and Google, where users can download mobile applications that have been approved by their organizations' IT departments. Also included will be the ability to remotely erase selected data from a mobile device — a useful function for any device that is lost or stolen. Enhanced capabilities for managing mobile applications, email and content will be added over the coming year. Also, CA Technologies recently acquired Layer 7 Technologies, which offers a robust, highly scalable, API access control and security gateway. As a result, IT will be able to use a single set of enterprise access policies for both CA SiteMinder® and the Layer 7 solutions. "For the ﬁrst time," says Varadarajan, "CA Technologies, the largest independent IT management and security provider, will offer a full solution and vision for enterprise mobility management." That should leave CIOs feeling secure indeed. — L.E.